Barefoot Books has recently added a new collection: The Gift Collection. 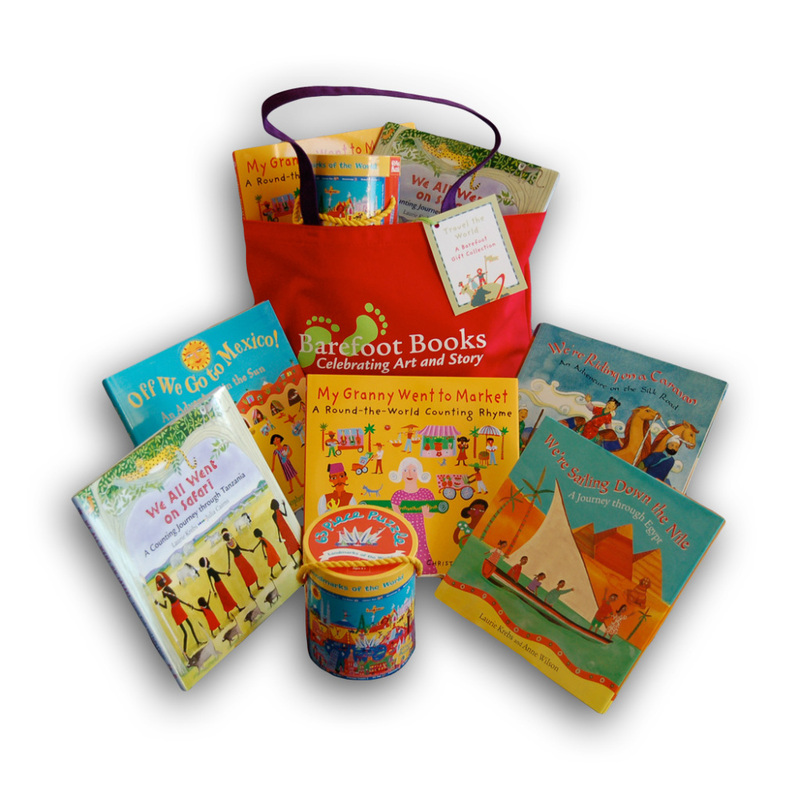 Each of these collection contain the best of what the Barefoot Books has to offer. These collections are perfect for your holiday gift-giving – for your baby, family, your child and everybody else! Check out below for the pictures. Packaged in a beautiful, colorful canvas tote bag with a gift tag to personalize, this enchanting collection features Baby’s First Book, Mother Goose Remembers with music CD, Mrs. Moon: Lullabies for Bedtime with music CD, Listen, Listen, Alligator Alphabet, Who are You, Baby Kangaroo?, Putumayo Dreamland CD, and an adorable Bo Peep Woolly Sheep puppet. Packaged in a beautiful, colorful canvas tote bag with a gift tag to personalize, this collection includes Storytime: First Tales for Sharing with story CD, The Story Tree: Tales to Read Aloud with story CD, The Gigantic Turnip, Jack and the Beanstalk, and The Prince’s Bedtime, all paired with a charming Prince puppet to help bring the stories to life! This collection contains Barefoot favorites Here We Go Round the Mulberry Bush, Port Side Pirates!, The Animal Boogie, Knick Knack Paddy Whack, We All Go Traveling By, and Whole World — all with singalong CDs! Best-selling books in this highly collectible selection include Mother Goose Remembers with music CD, I Took the Moon for a Walk, The Story Tree: Tales to Read Aloud, The Faerie’s Gift gift edition with story time CD, The Boy Who Grew Flowers, The Gigantic Turnip, The Barefoot Book of Classic Poems, and The Barefoot Book of Fairy Tales. The collection includes The Barefoot Book of Princesses with story CD, Magic Hoofbeats: Fantastic Horse Tales with accompanying My Magic Diary, The Faerie’s Gift gift edition with story CD, The Princess and the White Bear King gift edition with story CD, The Barefoot Book of Fairy Tales, The Barefoot Book of Ballet Stories, and a Princesses 100-piece puzzle. This fun and educational collection features We All Went on Safari: A Counting Journey through Tanzania, We’re Riding on a Caravan: An Adventure on the Silk Road, My Granny Went to Market: A Round the World Counting Rhyme, Off We Go to Mexico! : An Adventure in the Sun, We’re Sailing Down the Nile: A Journey through Egypt, and our colorful and interactive Landmarks of the World 64-piece puzzle! A board book that exemplifies minimalism at its finest! One sentence for each page. One subject and one verb. One thought throughout the whole book! This book is about Cleo, the Cat and her movements in and around her surroundings. It is a catchy board book that is very easy to remember. From the moment Cleo wakes up to the time Cleo starts to play and bounce around the yard, every reader will absolutely remember the actions that Cleo, the Cat is doing throughout the book. The illustrations perfectly fit the idea of minimalism. Caroline Mockford’s brush strokes on watercolor are simple yet conveys a brilliant rendition of the main character Cleo, an orange-striped Cat. Her choice of colorful background on each sturdy page of the book, adds a more striking appeal to the young reader. Great book for readers who are learning about simple action words! I could literally memorize all the lines of this book by now! Who wouldn’t if you are reading this book every single day with your child? My daughter just loves everything about the book ~ especially all the rhyming words, repetitive lines (which are very easy to memorize) and the sounds of each of the characters in the book which it makes it even livelier and more interactive. This book also is a good proof of the saying “Don’t judge the book by its cover.” When I first got this book from the mail, it really didn’t interest me that much. I am not sure why but the cover, despite its vivid color and the carefully designed drawing of a house with a man on it wasn’t that appealing upon its first sight. To me, it didn’t look as if the book was interesting at all. In fact, I felt like that book would just contain like some barnyard animals and the usual word-picture identification of the animals that you could see in the barn. But, boy I was wrong! This book is totally the opposite of my first impression. As soon as I went through the first page, the lines that slowly builds up from one incident to the next give the book a sense of interactivity. The book is also predictable in such a way that the reader would be able to instantly get the series of events as it unfolds. As the events build up, so as the characters. It’s like opening a present with the best surprise at the end of the wrapping paper! The CD is the best part of this! All the characters that are involved in each line gives out a particular sound which is beneficial for readers who are trying to associate words to sounds and vice versa. My daughter loves it whenever the words cat, dog, rat, cow, maiden and man come up because she could then make the sound that the book initially presented! It is a nice way for her to associate these sounds and remember these to connect to a particular word. To the winner: Please respond to the email that was sent to you within 72 hours to claim your prize. To all of you who participated in this giveaway: Thank you so much for your time and effort. Please stay tuned for OUR NEXT GIVEAWAY. In honor of the Olympics games 2008, I thought it might be a great time to give away to ONE lucky reader a FREE copy of the newly released Little Leap Forward: A Boy in Beijing written by Guo Yue and illustrated by Clare Farrow for the Barefoot Books Young Fiction. This book looks at a close friendship and at the conflict between political change and personal freedom. It contains 128 pages with at least 7 pages of colorful illustrations of the scenes from the book. It retails for $16.99. A great reading material for you or for your children. All entries must be posted on September 1, 2008. The winner will be notified and will be posted on this site. 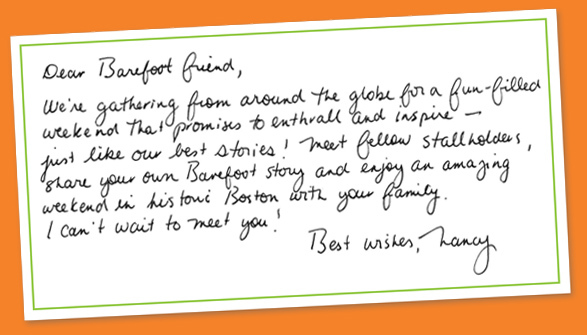 At the Barefoot Books International Conference 2008 in Cambridge, MA, Barefoot Book’s co-founder and CEO Nancy Traversy welcomed all the guests and stallholders and delivered a very insightful message to everybody at the audience. She was very enthusiastic and honest in every word she said, which truly made me feel connected with her and the company she and Tessa Strickland started in 1993. What I liked about Nancy was that she was very transparent in her message. She talked about their victories, the challenges that she and Tessa overcame for the past 15 years as the visionaries of the Barefoot Books. She was as vivid and colorful as the stories that the Barefoot Books publishes. You could certainly tell that you can not separate the company from her ~ because she speaks genuinely from the heart in every aspect of the company. She was proud to admit about their failures in setting up the Barefoot Books and even openly told us about all the mishaps she’s had between balancing motherhood and being a CEO of a very cause-driven, people-oriented and socially-aware company. I’d have to say she is truly a walking image of SUCCESS and I would like to share with everybody what I’ve highlighted from her message to Barefoot Books Stallholders and how you could apply that as well to whatever you do. 5. Be pioneering – Don’t just sit there and follow the traditional path. Do something that is unique. Do something more creative and pioneer in what you do. 6. Redefine success – Success is not always determined with how much do you earn in a year or how much money do you have in the bank but maybe if we redefine success based on other social causes and helping our community that might be a lot better. In accordance with the conference theme of Telling Stories, I wanted to share what Nancy Traversy said about storytelling ~ that Storytelling is the heart of what it means to be humans! Learning the facts is important but story and imagination are far more powerful. Become a Barefoot Books Stallholder!